Beckett's Political Imagination charts unexplored territory: it investigates how Beckett's bilingual texts re-imagine political history, and documents the conflicts and controversies through which Beckett's political consciousness and affirmations were mediated. The book offers a startling account of Beckett's work, tracing the many political causes that framed his writing, commitments, collaborations and friendships, from the Scottsboro Boys to the Black Panthers, from Irish communism to Spanish republicanism to Algerian nationalism, and from campaigns against Irish and British censorship to anti-Apartheid and international human rights movements. 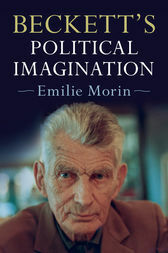 Emilie Morin reveals a very different writer, whose career and work were shaped by a unique exposure to international politics, an unconventional perspective on political action and secretive political engagements. The book will benefit students, researchers and readers who want to think about literary history in different ways and are interested in Beckett's enduring appeal and influence.